Every year nearly 1.5 million Americans receive a diagnosis of cancer. Cancer is not a single disease, however. It is many different diseases that all share one common characteristic: Some of the body’s cells do not die when they should. Instead they continue to grow and divide. Through this process, cancer cells can damage the body’s tissues and organs, leading to a broad array of symptoms and even death. The cellular changes that lead to the development of cancer is sometimes inherited but they may also result from environmental or lifestyle factors. Although the survival rates for many types of cancer have improved in recent years and innovative treatment protocols are being developed, cancer remains the second leading cause of death in the United States. 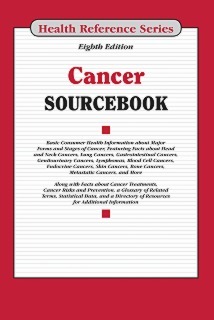 Cancer Sourcebook, Eighth Edition provides updated information about common types of cancer affecting the head, neck, central nervous system, endocrine system, lungs, digestive and urinary tracts, blood cells, immune system, skin, bones, and other body systems. It explains how people can reduce their risk of cancer by adopting a healthy lifestyle, addressing issues related to cancer risk, and taking advantage of screening exams. Various treatment choices—including surgery, chemotherapy, radiation therapy, bone marrow transplantation, and biological therapies—are discussed, and facts are provided about cancer clinical trials and other ongoing research. The book concludes with a glossary of related terms, a directory of national cancer organizations, and suggestions for finding community-based resources. This book is divided into parts and chapters. Parts focus on broad areas of interest. Chapters are devoted to single topics within a part, and sections explore aspects of some topics in greater detail. Part I: Cancer Risk Factors and Cancer Prevention introduces cancer, discusses hereditary, lifestyle, and environmental factors that can sometimes set the stage for the growth of cancer. It explains which factors can be prevented and which factors are unavoidable. Statistical information about cancer prevalence, mortality, and survival is also provided, along with facts about specific population groups that suffer disproportionately from cancer. It concludes with myths and misconceptions regarding cancer. Part II: Common Types of Cancer includes a head-to-toe list of the most frequently occurring types of cancer. Individual chapters describe the development, identification, and treatment of cancers that affect the various components of the body, including the brain and central nervous system, endocrine system, respiratory system, blood and immune system, digestive and urinary tracts, and reproductive organs, as well as the bones and skin. Part III: Cancer-Related Tests, Treatments, and Care Giving describes the screening methods used to find cancers at their earliest stages and the procedures most commonly used in cancer diagnosis and treatment. These include medical imaging tests, surgical procedures, chemotherapy, radiation therapy, precision medicine, stem cell transplantation and various complementary and alternative medicine (CAM) practices used in cancer care. It also provides information on how to find healthcare services, managing medical costs and information, nutrition care, and concludes with role of care givers. Part IV: Recurrent and Advanced Cancer explains the factors that cause cancer to spread to distant parts of the body and to come back again after a time of remission. It describes end-of-life care, decisions to be taken by cancer patients and their families, and offers suggestions regarding ways to make wishes known. Part V: Cancer Research discusses cancer treatment trials and other studies of new medications. Emerging therapies for cancer treatment and prevention, including vaccines, gene therapy, and proton therapy, are also described. Part VI: Additional Help and Information includes a glossary of terms, a directory of national cancer organizations, and suggestions for finding local resources. A chapter offering cautionary guidance about cancer-related health fraud, especially on the Internet, is also provided. Include access to Health Reference Series Online.